Neither remorse nor sorrow is anywhere to be seen in Neemdiwali village of the district where two young lovers were done to death yesterday allegedly by the girl’s family members. The girl identified as Monika of Neemdiwali and her young lover Rinku, who hailed from Manheru village, had been in love for the past two years. Haryana’s former Deputy Chief Minister acted “irresponsibly” in a 1989 land acquisition matter, the Punjab and Haryana High Court has ruled. Power cuts are back again and this time with a vengeance. The situation has deteriorated ever since transplantation of paddy began on June 15. “There is fixed schedule given by the authorities. Power plays truant leaving the residents high and dry,” alleged Rajnish Kumar, a resident of Dabwali Road, Sirsa. Hisar: In view of the increased demand for power for farming operations of Kharif crops, the DHBVN has decided to increase power supply to the agriculture tubewells to eight hours daily. The Jewels Group of Hotels today launched its first five-star hotel “Noor Mahal” in Karnal, adding a new chapter to the hospitality industry. 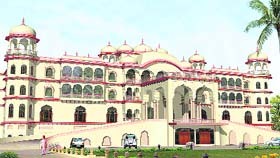 Spread over 8 acres on Karnal bypass and carpet area of 3.50 lakh square feet, reasonably priced “Noor Mahal” has 122 rooms, seven banquet halls and the biggest convention hall in India, having a capacity of 2,000 guests. A number of assistant public relation officers working on contract at various district headquarters across the state have rued the failure of the government to revise their pay scales, which have remained unchanged ever since they joined duty about two years ago. The police have worked out a strategy to enhance security at petrol pumps and banks that have become an easy target for robbers. A major fire broke out in a godown of the Bata company at Bata Chowk here today. A large number of goods were destroyed in the fire. This godown was the main hub for business operations of the company in northern India. Former Haryana IG MS Ahlawat, who has been facing the molestation charge, today filed an anticipatory bail application in the Punjab and Haryana High Court. The BJP district unit is shrinking as rift among senior leaders has affected the political graph of the party, which is fast declining from the past couple of years. Rift between the leaders resulted in the defeat of party candidates in past LS and Assembly polls. A student of postgraduate diploma in journalism and mass communication had to wait for one year to get his postgraduation degree allegedly due to the negligence of Kurukshetra University. The Deputy Commissioner has announced to get a case registered against 19 booth-levels officers (BLO) for remaining absent from the work of survey of the voters’ list in the district. The Brahmin Sabha staged a demonstration in protest against the alleged failure of the police to track down the culprits in the triple murder case at Khokri village here even after 44 days of the crime. Under pressure from their families, a couple belonging to different castes today decided to live separately, just five days after their marriage at Satroad Kalan village in the district. A tipsy man clubbed his wife to death at Sidhani village near Jakhal on Saturday. The victim’s daughter, who tried to intervene, also invited the wrath of her father and sustained head injuries. The police has arrested seven Dalit youths in connection with the attack on the houses of two Jat residents of the village last week. Neither remorse nor sorrow is anywhere to be seen in Neemdiwali village of the district where two young lovers were done to death yesterday allegedly by the girl’s family members. The girl identified as Monika of Neemdiwali and her young lover Rinku, who hailed from Manheru village, had been in love for the past two years. Rinku had been living with his maternal uncle in Neemdiwali village, where he worked as a milkman. Their luck ran out yesterday when they were caught in a compromising position. The couple was brought to the house of Monika’s uncle and severely beaten up with a rod. They succumbed to their injuries there itself. Their bloodied bodies were then hanged from the ceiling of a room from where these were recovered by the police. The entire room had blood on the floor and the blood-soaked rod was also found there. The police was tipped off by an anonymous caller from the village. Though no villager is willing to talk on the issue, the police says it is clearly a case of honour killing. A murder case has been registered against seven persons, including the parents of the girl, her two uncles and their wives and another villager. Rinku’s uncle Krishan too was informed by someone from the village over the telephone. The police registered the case on his complaint. Sources said a few of the accused had been “rounded up”, but the police maintained that no arrests had been made as yet. The villagers are tightlipped. Outsiders are greeted with hostile stares. However, street urchins need not be prodded. They readily give directions to the house where they say a “premi joda” was killed. The doors of the house are closed. Bystanders, however, warn outsiders against approaching the house. No reasons are given or asked. The angry stare is enough to deter even the brave hearts. Women are indoors. The few elderly residents resting on cots under the shade of trees avoid exchanging a glance with outsiders. This is highly unusual. Normally they would greet visitors with a warm “Ram Ram ji”. But, that’s about all that is different in the village today. Barring this total indifference, everything else is normal. There is no sense of sorrow over the death of two young villagers. No one appears to be remorseful of the brutal killings. This by itself is a strong statement against youths flirting with the idea of love or physical intimacy. In the harsh and vast desert stretches of Haryana, water is considered more precious than tears. But not even a crocodile tear is being shed for the sprightly, young and beautiful girl who met a gruesome death barely 24 hours before at the hands of those who gave her birth and then reared her. That is cruelty redefined by rural Haryana! Monika’s mortal remains were literally disposed of by burning rather than cremating this evening. The mourners, if you can call them so, did not wallow in sorrow. “It was you may say more or less like we burn wheat stumps in the fields,” said the kiosk owner almost mockingly. As if on cue a farmer sipping tea remarked: “What do you expect for the dead?” Did her cries melt her mother’s heart while she was butchered? From his expression, his tea did not seem to taste any less sweet while he aired these thoughts. The LAO had recommended against acquiring land of the people with “A” class constructions. Land having “B” and “C” class constructions was rightly acquired, the state had contended. The hard line ruling came on a petition filed by Ram Kishan Gupta and other petitioners against the state of Haryana and another respondent. They had assailed the notifications dated March 8, 1989, and March 7, 1990, under Sections 4 and 6 of the Land Acquisition Act. The petitioners had contended that the state government, through the notifications, was seeking to acquire the land for the public purpose of developing and utilising the land for residential and commercial area, Sector 9, 9A and 10 in Gurgaon. The counsel for the petitioners had added that the LAO discriminated. He has “recommended release of land to some persons with construction and excluded the petitioners with malafide intentions.” Moreover, the LAO’s report submitted under Section 5-A of the Act was blindly accepted without any speaking order. “The authorities should at least warn the residents before enforcing any power cuts. We often end up leaving half-cooked food in the microwave or partially washed clothes in the washing machine,” said Vaneet, a homemaker from Fatehabad. The situation is no better in rural areas. Not a single day passes when a road is not blocked or a power substation is not “gheraoed” by angry villagers. A spokesperson of the Dakshin Haryana Bijli Vitran Nigam (DHBVN), however, claimed that the cuts had been rescheduled from today to provide people fixed timings of cuts. “Consumers in the urban areas will get supply for 20 hours and there will be fixed timings for power cuts, if necessary,” he said, adding that there will be four cuts of one-hour duration each in the areas of Sirsa and Fatehabad, including some other districts like Hisar, Palwal and Bhiwani. The residents in these area will face cuts from 6-7 am, 9-10 am, 12 noon to 1 pm and 6-7 pm. “In view of paddy sowing and increased requirement for other Kharif crops, supply to tubewells has been increased to eight hours a day,” said the spokesperson. He said power supply to tubewells in Fatehabad and Sirsa will be in three groups from 8 pm to 4 am, from 12 noon to 8 pm and from 4 am to 12 noon, respectively. The industrial feeders will run from 8.30 am to 6 pm and from 11 pm to 5.30 am daily. Time for peak load hours will be 5.30-8 a.m. and 6-10 pm daily, said the DHBVN spokesperson. A spokesman for DHBVN said here on Monday that power supply to tubewells would be given in two groups in district Hisar and operation circles of Bhiwani, Narnaul, Gurgaon and Faridabad. Tubewells in Fatehabad district and Sirsa Circle will get supply in three groups. In Hisar district, tubewells in group I will run from 11 am to 6 pm daily while group II will get supply from 6 am to 2 pm. Group I in Bhiwani will run from 11 pm to 6 am and 4 pm to 5 pm daily and group II will run from 8 to 4 pm daily. Group I in Narnaul circle will get supply from 11 pm to 6 am and 5-6 pm daily while group II will run from 6 am to 2 pm. In Gurgaon group I will run 11 pm to 6 am and 4-5 pm daily and group II will get supply from 8 am to 4 pm daily. In Faridabad, group I will run from mid night to 7 am and 3-4 pm while group II will get supply from 7 am to 3 pm daily. The segregated rural feeders will run in two groups. Group I in the areas of Operation Circles Faridabad, Gurgaon, Bhiwani and Hisar will run from 4-6 am, 1-2 pm and 6 pm to 3 am daily, while group II will run from 6-8 am, 2-3 pm and 6 pm to 3 am. In the areas of operation circles, Narnaul groups I and II will run from 1-2 pm and 2-3 pm, respectively, during day and from 7 pm to 6 am during night. In the area of Sirsa circle, group I and II will run from 11 am to 2 pm and 2-5 pm, respectively, during day and from 7 pm to 3 am at night. The promoter of Jewel Group, Manbeer Chowdhary, former president of the Federation of Hotels and Restaurants Associations of India (FHRAI), said India had vast potential for developing the hospitality industry, but cumbersome official procedures involving 40 clearances from the state government and two from the Centre was a great disincentive and discourage for entrepreneurs, who wished to start a five-star hotel. Observing that the “Incredible India” campaign had put the country on world tourism map and the recent survey of the leading travel magazine “The Conde Naste” elevating India from the ninth to the fourth position in “must-see” list had provided unlimited opportunities to showcase India’s traditional and cultural wealth. Asserting that the inflow of foreign tourists had increased to nearly 6 million in the recent years, Chowdhary said the craze for unique Indian architecture, reflecting the royalty of the bygone era has put the Indian hospitality industry on a high pedestal and a sustained campaign was needed to build the tempo. Chowdhary told mediapersons that the hotel had been built keeping in mind the heritage concept and the traditional Mughal and Rajput architecture had been beautifully mixed to add to its elegance. The tariff was just Rs 5,000 per room, he added. Hailing from the Army background, Chaudhary got “Noor Mahal” inaugurated by his father Chaudhry Dalip Singh and mother Jaswant Kaur in the presence of MP Arvind Shama and former union minister of state for home ID Swami. A delegation of the APROs stated that they had joined the state department in April 2008. Though the posts that were advertised mentioned the pay scale of Rs 12,000, the government increased it by Rs 500 the day they joined the duty. Since then there had been no revision in their pay scales. “We neither get any additional benefit, nor paid for the calls that we make from our mobile phones on duty. There are no allowances for us. We have to travel far to cover official functions of the government and we are not given any travelling or halting allowance,” said one of the APROs. Regular APROs working with the department got better salaries as compared to them even as the work was the same for them. “Some other employees, who work at much lower ranks than us, are getting better pay while we remain neglected. It is high time that the government should consider our demand and give us some relief,” the APRO added. What has proved more disturbing for the APROs of the state is the fact that the APROs working with the Chandigarh administration on contract are getting Rs 19,500. “It is very demoralising for all of us. The government should immediately remove the disparity in the pay grades and give us our due,” said another APRO. They said at least the government should provide them with some allowance and reimburse the expenditures incurred by them while on government duty. As of today, there are 26 APROs working with the department, who were finding it hard to make both ends meet as a major portion of their salaries was spent on official work, said one of the APROs. They said a delegation of the APROs had repeatedly taken up the matter with the officials at the highest level and even met Chief Minister Bhupinder Singh Hooda twice pleading their case, but till date no relief had been provided to them. District police chief Rakesh Arya said the department had been holding meetings with the representatives of petrol pump owners and banks officials operating within the jurisdiction of the district and evolved a line of action that could be put into force to protect these establishments against any robbery attempt. The SSP said petrol pumps owners and bank officials had been asked to install CCTVs on their premises so that the recordings could provide vital information that could lead to timely action in case any untoward incident. Besides, they have also been told to appoint private security guards. He said during the discussions it had emerged that at times certain vehicles that approach petrol stations do not carry a number plate. Under such circumstances the petrol pump owners should immediately inform the police and take precautionary measures as it could be a robbery attempt. Also, the owners have been asked to get police verification done of those working for them to rule out the possibility of an insider providing information to miscreants. Arya said the officials of 160 banks that operate in the district have also been asked to make certain that access to the ATMs could only be gained through card swapping so that complete information of those who enters the ATM could be obtained when required. He also directed the officials to get security equipments on the bank premises checked from time to time. Though there were no reports of casualty, the entire administrative machinery was busy in fire-fighting operation at the time of incident. According to Sanjeev Verma, a personnel of the Bata company, the fire broke out due to short-circuit. It came to light only when smoke was noticed from the godown but by that time it had spread to a larger area. There were several sections in the godown where goods like leather, rubber, etc, were stored. On account of availability of inflammable goods in the godown, the fire spread out fast. Smoke emanating from the goods compounded the problem of the fire-fighting operations. 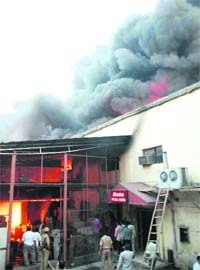 A large number of employees were present in the godown when the fire broke out. More than 12 fire tenders were pressed into service, including the ones from the local Air Force Station and those owned by private companies like Whirlpool, Yamaha, JCB, etc. These were in addition to the tenders of the Haryana Fire Services and the ones of the Municipal Corporation Faridabad. Faridabad Deputy Commissioner Praveen Kumar, who rushed to the spot along with senior officers of the district, said things were under control and measures had been taken to ensure that the fire did not spread. The entire area was cordoned off and the police was deployed around the area. The workers of the company were also seen busy in fire-fighting operations. The district administration would initiate a probe into the cause of the accident after the fire was tamed. The exact amount of financial loss occurred to the company could not be assessed at the moment. The application was filed through his counsel Ajay Jain, who had also represented former Haryana Director-General of Police SPS Rathore, convicted in the Ruchika molestation case, in various courts. Ahlawat’s bail plea was earlier rejected by a Yamunanagar court. The high court is likely to hear his plea tomorrow. The anticipatory bail has been sought on the ground that the Yamunanagar police had opposed his plea in the local court primarily because it wanted to take his voice and handwriting samples. Jain has contended that his client is willing to join the investigation and give his voice and handwriting samples. Therefore, his custodial investigation is not necessary. Ahlawat’s counsel has also pleaded that the complainant had been improving her version of the incidents in her various complaints as “an after thought”. He has said there is nothing in the transcript of the telephonic talk between his client and the complainant that suggests molestation. At best, he has taken the plea, Ahlawat can be accused of trying to seduce the complainant, which is no offence. The BJP in Ambala district has been dominating for a long time with a strength of thousands of party members, but it has now drastically shrunk to merely a few hundred at present. The party started a membership campaign a couple of months ago but failed to get required response. A senior local BJP leader on the condition of anonymity admitted that increasing in-fight among party leaders has scarred the image and credibility and has in turn helped strengthening of the opposition parties in the area. Due to lack of unity among the leaders as well as workers, most of the campaigns launched and announcements made by the party in the district have proved fruitless, he added. It was shocking to see that local BJP MLA and opposition leader in the state Assembly Anil Vij was not invited when party’s national leader Sushma Swaraj visited the town sometime ago. Sources in the party said most of the BJP leaders in the constituency did not extended support to the local MLA. Some of the prominent local leaders said the party needed a sincere leader in the state to save the sinking ship, reunite the scattered pieces and gain confidence of the people. Vaibhav Bhatnagar, a resident of Ambala City, had sent a letter to the Vice-Chancellor of the university in this regard, in which he stated that he had appeared in the examination in 2009. The result was declared in September 2009. The marks sheet sent by the university showed compartment in a subject - electronic media - with 30 marks. He applied for revaluation of the subject, but the university did not respond. Later, he filled the form for compartment exam thinking that if he could not get the passing marks in the revaluation, he would take his compartment exams. He further said he appeared for the compartment exam, but before the announcement of the result of the compartment exam, the university sent him the certificate of diploma in journalism in which it was mentioned that the student had got 60 marks in electronic media. Vaibhav said the negligence ruined his one year. He said he had also suffered financial loss by depositing fee for compartment and revaluation with the university. He added that if he would not be heard by the university, he would be left with no other option but to knock the doors of the court. The election authorities, which have been carrying out a fresh survey of the voters’ list from June 15, had appointed these BLOs for the work. However, it is reported that these officials failed to turn up at the meetings held on June 8 and 10 and did not report back even after being given notice and reminders regarding the job assigned. The offenders will be booked under the provisions of Section 32 of the Public Representatives Act-1950. The police had been given a list of such officials for further action in this regard, said the Deputy Commissioner. A majority of offenders are teachers in government schools in the district. The officials have been identified as Bhateri Devi, Birmati, Sarita, Rajender, Sunita, Suman Lata, Dharmvir, Vijay Kumar, Ashok Kumar, Satish, Joginder, Virender Singh, Sheelawanti, Rajkumari, Neelam Devi, Jagwanti, Santosh, Kanta Devi and Chanderkanta. The Brahmin Sabha staged a demonstration in protest against the alleged failure of the police to track down the culprits in the triple murder case at Khokri village here even after 44 days of the crime. While the dharna by the Kandela khap entered the seventh day today, the local administration had to deal with a demonstration organised by the Brahmin Sabha on the same issue. The sabha blocked the Jind-Gohana road for an hour. It also submitted a memorandum to the DC, warning to step up the stir in case of no breakthrough in the case. This was the second time in the past 15 days that the Brahmin Sabha had to resort to agitation to highlight their resentment over the issue, said Rajesh Sharma, president of the sabha. The sabha alleged that some of the cops and officials had failed to take the matter seriously and had been misleading the senior officials. The sabha announced to set up a 21-member committee, which it said would meet the CM on June 26 and UPA chairperson Sonia Gandhi to step up the pressure on the authorities concerned. A woman identified as Mukesh (30) and her nieces Seema (16) and Tamanna (10) were done to death in Khokri village on May 9. However, the village panchayat denied that it had played any role in the couple’s decision. Sonu and Sonia of the village got married on June 16, but today they gave a joint statement to the panchayat that they wanted to live separately. The parents of the couple were against their inter-caste marriage. While Sonu belongs to Saini caste, Sonia comes from Chamar caste. The couple had married secretely at a temple, village sarpanch Dhoop Singh said. He said there was no diktat from the panchayat to the couple asking them to live separately. “The families of the couple were not in favour of their marriage and we have no role to play.,” he said. Singh denied that the panchayat had issued any diktat to the boy or his family to leave the village. The police said the accused, Mithu Singh, came home at 11 last night in an inebriated condition and demanded money from his wife, Bala (45), for buying more liquor. The woman, who was fed up with her husband’s drinking habits, refused to oblige. Infuriated at her denial, the accused hit the victim several times with an iron rod, killing her on the spot. The victim’s daughter, Nanki, tried to intervene, but she, too, was hit by the accused. Hearing the cries of the victim, Mithu Singh’s brother Jagan and Jalsa, who lived in the adjoining house, rushed there. By then the accused had fled from the scene. The accused is at large, according to SHO Khyali Ram. Another youth Virender Rana was arrested earlier on the charge of attacking CID official Jagjit Singh a day after the clash. The CID official was on duty in the area when he was attacked with a sword. He was seriously injured. Meanwhile, the police continues to be deployed in the locality to prevent any untoward incident.